I’ve found a kitten! What happens next? If the kitten you’ve found is younger than four weeks old, DO NOT remove it without waiting to see if the mother returns! Although you might think you’re doing the right thing, removing a neonatal kitten from its mother can be a death sentence, especially if the shelter or rescue you take it to does not have a foster family to bottle-feed it around the clock. Mother cats must leave their kittens to hunt and usually return within three hours. Sometimes the mother cat is moving her kittens and you might find one of her kittens while she is in that process. HELPFUL HINT: If you cannot stay with the kittens to watch for the mother, scatter a ring of flour around the kittens. If the mother returns, you will see her paw prints in the flour. The mother came back! What happens next? Determine if the mother is feral (unsocialized and afraid of people) or friendly. 1. Contact local rescue organizations to see if a foster home can be found. Unfortunately, during the spring and summer months most rescues and fosters are completely full and must turn away kittens due to lack of resources. If you are able to foster or make a donation to a rescue, mention this when you contact the rescue. 2. If no foster home can be found, consider taking the family to a local municipal shelter. Most shelters will try to transfer mothers with nursing kittens to a rescue. 3. If no shelter or rescue is available and you cannot foster the mother and kittens, consider feeding the mother and interacting with the kittens to socialize them while they continue living outside. Mother and kittens can be neutered and adopted out once they are of age. 1. The ideal scenario is to humanely trap the mother and find a foster home or rescue to take the mother and kittens so the kittens can be socialized. Once the kittens are weaned, the mother can be spayed and returned to her outdoor home. 2. If no shelter or rescue is available and you cannot foster the mother and kittens, consider feeding the mother and interacting with the kittens to socialize them while they continue living outside. 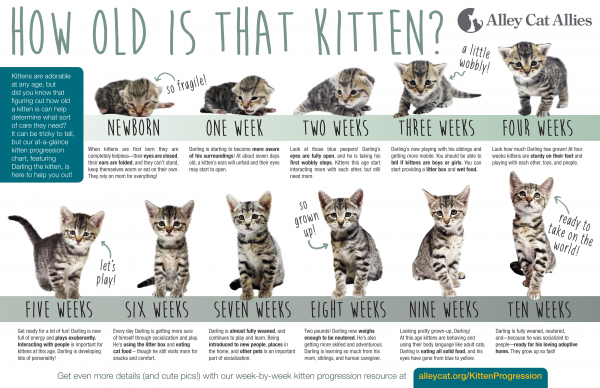 Once the kittens are weaned, they can be neutered and adopted out. The mother must be spayed, after which she can be returned to her outdoor home. Consider contacting a feral cat group for assistance with spay/neuter. How should I decide when to remove the kittens? Kittens who are clean and sleepy likely have a mother who is taking care of them. Dirty, crying kittens MAY have been abandoned and need rescue. Are the kittens in danger? Is it raining, snowing, or extremely cold or hot? Are there dogs or wild animals running lose who might harm the kittens? Are there kids or adults in the neighborhood who are likely to harm the kittens? If the mother does not return, you must decide whether you are willing to bottle-feed the kittens if they are under four weeks. Neonatal kittens require a lot of care and few rescues and shelters have the resources to give this care. Consider whether or not the kittens are friendly or feral (unsocialized to people). Make sure the kittens do not belong to anyone before you try to re-home them. If you are sure the kittens do not have an owner, contact local rescue organizations to see if a foster home can be found. Unfortunately, during the spring and summer months most rescues and fosters are completely full and must turn away kittens due to lack of resources. If you are able to foster or make a donation to a rescue, mention this when you contact the rescue. If no foster home can be found, consider taking the kittens to a local municipal shelter. If the kittens are healthy, shelters are usually able to find homes for them or transfer them to a rescue. If the kittens are between five and eight weeks, it is possible to socialize them and adopt them out. It becomes very difficult to socialize feral kittens after eight weeks. Once a kitten reaches this age, the best option is to humanely trap the kitten, spay or neuter, and return him to his outdoor home. See contact information for feral cat groups. After you’ve found placement for the kittens, it is VERY important that you continue to look for the mother (and father) to have them spayed and neutered. Cats can become pregnant again even before their kittens are fully weaned, so if the mother and father are not trapped and neutered, you will quickly find yourself in the same situation.